Bulgaria declared a dangerous weather “Code Orange” warning for 17 districts in the northern half of the country and along its entire Black Sea coast for October 30 2017. The districts subject to the warning are Bourgas, Dobrich, Gabrovo, Lovech, Montana, Pleven, Razgrad, Rousse, Shoumen, Silistra, Sliven, Turgovishte, Varna, Veliko Turnovo, Vidin, Vratsa and Yambol. 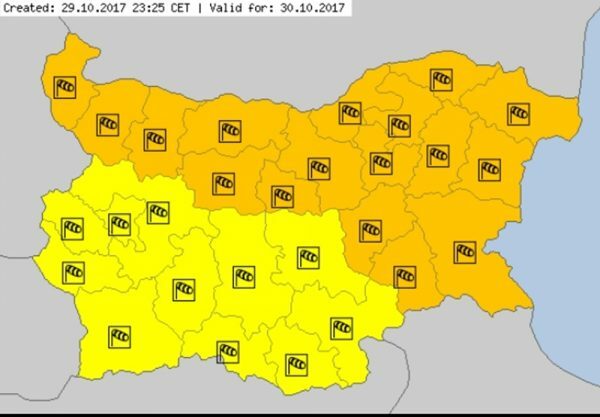 The lesser “Code Yellow” warning of potentially dangerous weather, again because of forecast high winds, applied to all other districts in the country, including capital city Sofia and second-largest city Plovdiv.